Lens Luxation is a painful and blinding eye condition caused when the ligaments or zonules which hold the lens in place inside the eyeball, lose their strength or break, allowing the lens to fall out of position. The lens can then move about within the eye and cause damage to other intraocular structures. Normally the lens is suspended between the iris (the coloured part of the eye) and the vitreous (the clear gel in the back of the eye). When the lens detaches from the zonules and falls forward, it is called an anterior luxation. Less commonly, the lens can fall backwards into the vitreous; this is called a posterior luxation. *Illustration courtesy of David Gould, Davies Veterinary Services. 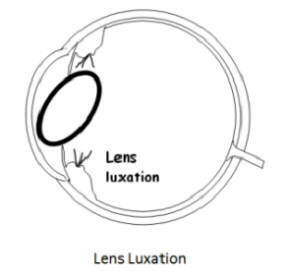 Generally, a lens luxation can be PRIMARY or SECONDARY. 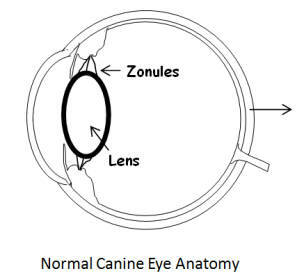 **The Animal Health Trust, having identified the gene responsible for PRIMARY Lens Luxation in many breeds of dog, offer genetic testing for this condition. During 2012, the AHT ran a Mutancy Frequency Check on samples of DNA from a wide cross section of the Lakeland Terrier population in the UK. The AHT subsequently reported that all samples received by them were clear of the PLL mutation. 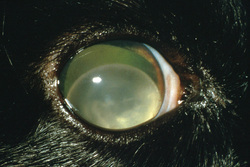 An anterior luxation is a veterinary emergency. When the lens luxates, the pressure inside the eye rises rapidly. Increased intraocular pressure can cause glaucoma and blindness within a few hours, without urgent treatment, loss of vision is irreversible. Posterior luxation causes less serious problems and can sometimes be treated with drug therapy. A posterior luxation can change to become anterior. Therefore, regular check-ups by a vet specialising in ophthalmology are necessary to prevent further damage to vision.